An all-volunteer organization, Save A Kitty is dedicated to saving the lives of homeless, abandoned and abused cats while simultaneously working to help prevent more unwanted births in Southern California. Officially incorporated as a non-profit in 2008, they have been actively involved in the rescue business for much longer. As the CEO and Founder, Debbie Eskow runs the day-to-day operations of Save A Kitty with help from her husband and Sue Winett, the Vice President of the group. Everyone who works with Save A Kitty volunteers their time. They receive no financial assistance from federal, state or local government agencies, and all of their income is generated through grants and personal donations. Recently they held an online auction, a fundraising method they hope to use again on a regular basis. While their efforts are primarily on behalf of cats, they are deeply committed to helping any animal in distress - even including the occasional turtle! They take inspiration from the following quote from Gandhi: “The greatness of a nation and its moral progress can be judged by the way its animals are treated.” Their work reminds us of another quote often attributed to this tireless peace worker … “Be the change you wish to see in the world”. According to Debbie, they operate according to the premise “that all creatures are created equally”, and that humanity must keep in mind that we “share this planet with all its inhabitants”. She strongly advocates for the welfare of all creatures great and small, and that tenet is reflected in the rescue’s daily endeavors. Together, they are resolved to make a significant change in the way we educate our young about respect for all beings, and that we should not turn a blind eye to “the suffering that surrounds us”. It is their hope, as well as ours, that the future will hold solutions to pet overpopulation utilizing methods other than extensive use of euthanasia. Even though they do not have a formal foster program, they do operate a network of volunteers, most of whom have been partnering with them for years to provide for the day-to-day needs of their rescued kitties. The average duration an animal remains in foster care prior to adoption varies, but ranges from anywhere between 2-to-6 months for kittens, while adult cats tend to be more challenging to place in a loving forever home. All of the animals entrusted to their care are spayed or neutered prior to adoption, and all receive superlative care while fostered by Save A Kitty. Their track record for socializing feral kittens is excellent, using a protocol of constant nurturing, reassurance and repetitive handling. 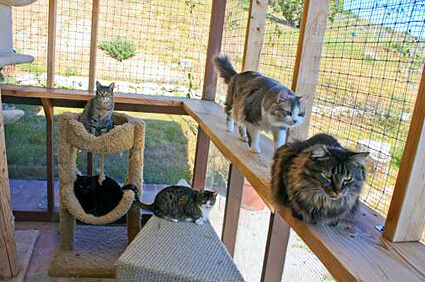 At their base of operations on a ranch in rural Acton, CA, they are able to care for as many as 65 cats at a time. In addition to the areas on the ranch set aside for fostering, Save A Kitty operates a small network of foster volunteers who provide cage-free home environments for rescued foster kitties. As of a couple of months ago, the total number of creatures in care of their network was more than 80, including some canines. On any given day, you’ll find dozens of comfortable cats basking in the sunlit enclosure, enjoying the expansive view of natural wildlife. For the most part, their felines are never caged unless it’s for their own safety. All newly rescued kitties are quarantined for a minimum of 15 days to ensure no undetected diseases can spread through the colony. These hard-working folks are not content with maintaining the status quo, expanding their operation on several fronts. In the last three years, they’ve constructed a number of large enclosures, increasing their fostering capacity. They purchased and remodeled an RV for use as a stand-alone quarantine area. And they’re no strangers to partnering with other animal organizations, including the Los Angeles County Shelters with whom they worked to resolve an animal abuse and neglect situation. Their short-term goals include continuing to save the lives of homeless felines living on the streets near Los Angeles and working to curtail pet over-population through public awareness and implementation of TNR strategies. One day, they hope to establish a large no-kill sanctuary of their own. This ambitious little rescue has big plans, hoping to one day enter the fray of advocating for the world’s big cats (lions, tigers, panthers, etc. ), many of whom face an unfortunate future at the hands of poachers and deforestation. In 2011, they were able to secure adoptive homes for 24 cats, and have every intention of increasing that number this year. 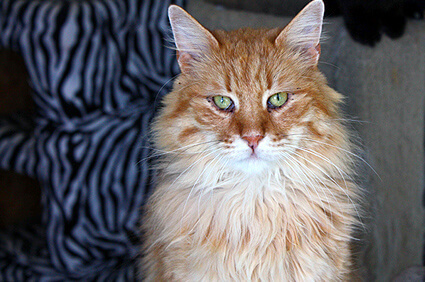 About two dozen cats are considered permanent residents of Save A Kitty, as they either have medical conditions or behavioral problems, attributes that have unfortunately proven to be obstacles when it comes to their prospects for adoption. The funds supplied by Dr. Jane’s HealthyPetNet Foundation will go to help defray the costs of daily operations, including veterinary care, medical supplies, food, litter, beds, blankets, toys and more. It is our great hope that the grant will help ease the financial burden of making sure Save A Kitty’s wards receive the care they so well deserve. Everyone here at Life’s Abundance sends kudos to this amazing small rescue for their significant work towards creating a better life for abandoned and feral animals. Most especially, we are thankful to all of our readers and customers who, through their personal donations and continued patronage, make all of our grants possible. Your kindness and commitment to pet health has directly helped this devoted group of volunteers to make the world a better place for abandoned, abused and neglected animals. Everyone loves what you guys are up too. This sort of clever work and coverage! Keep up the very good works guys I've incorporated you guys to my own blogroll.